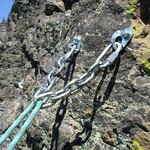 The longest bolted 5.9 in the United State. It was Memorial Day weekend, and with Monday off work and a stable weather forecast, it was a good weekend for a couple of longer routes. So I met up with John in the WA Pass/Mazama area and we climbed Flyboys on Goat Wall on Saturday and The Hitchhiker on South Early Winter Spire on Sunday. 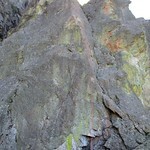 This page gives a short trip report for Flyboys on Goat Wall. 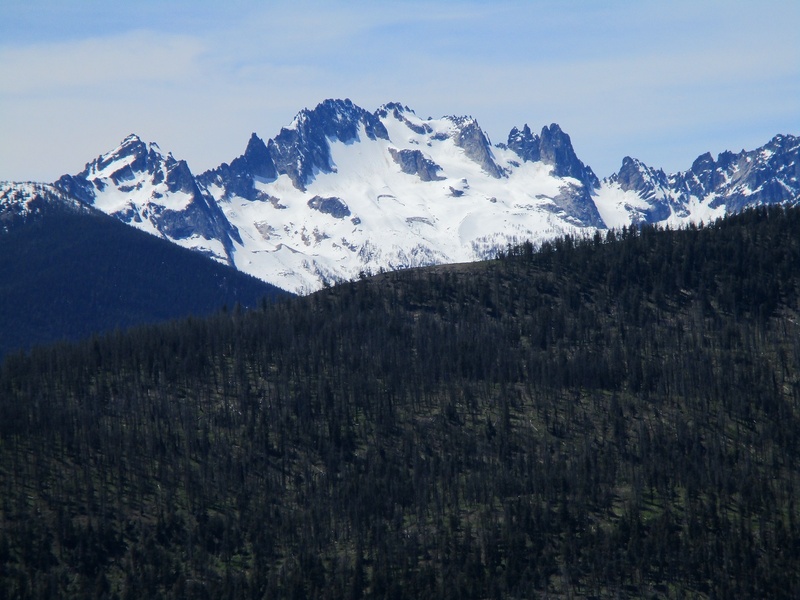 Goat Wall is a 1000-2000 foot tall massif of andesitic breccia and tuff above Mazama, just east of Washington Pass, in the North Cascades. 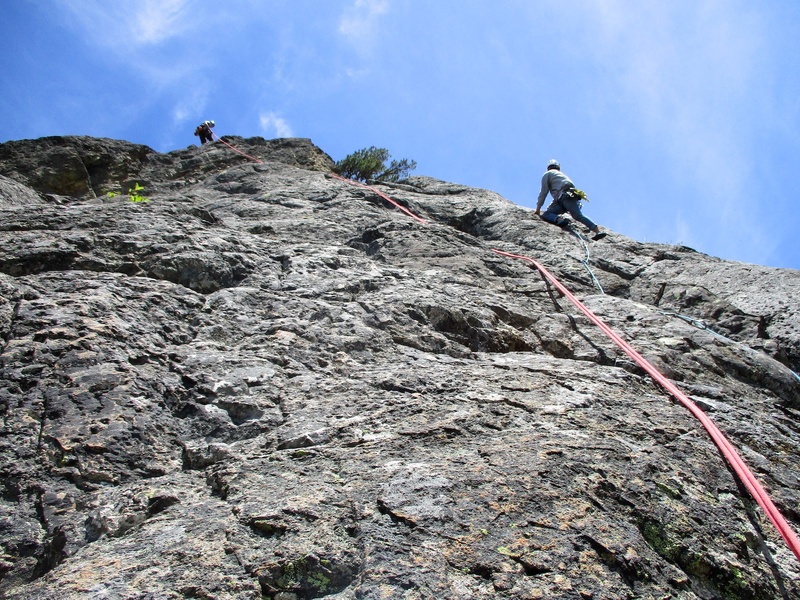 The wall is known for its multipitch sport climbs on mostly good rock, like Prime Rib of Goat (5.9, 1100 feet), Flyboys (5.9, 1500 feet), Restless Natives (11c, 1100 ft), and Sisyphus (11a, 1500'). 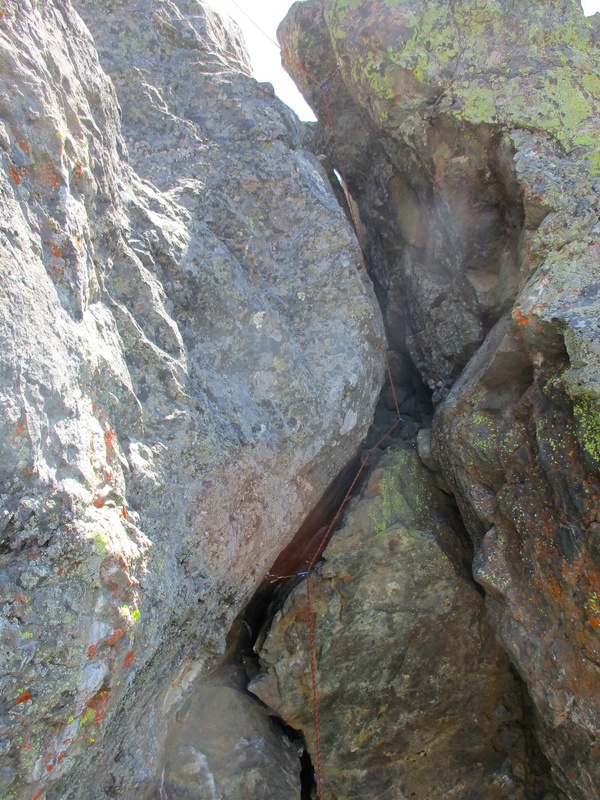 Flyboys ascends Goat Wall's central rib in 18 pitches and 275 bolts. 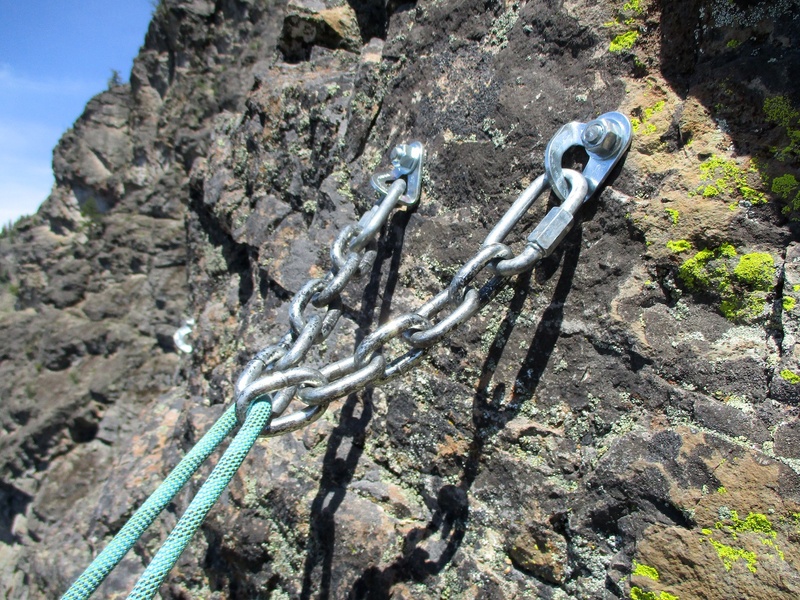 As of 2018, it the longest route on Goat Wall, and perhaps the longest bolted 5.9 in the United States. 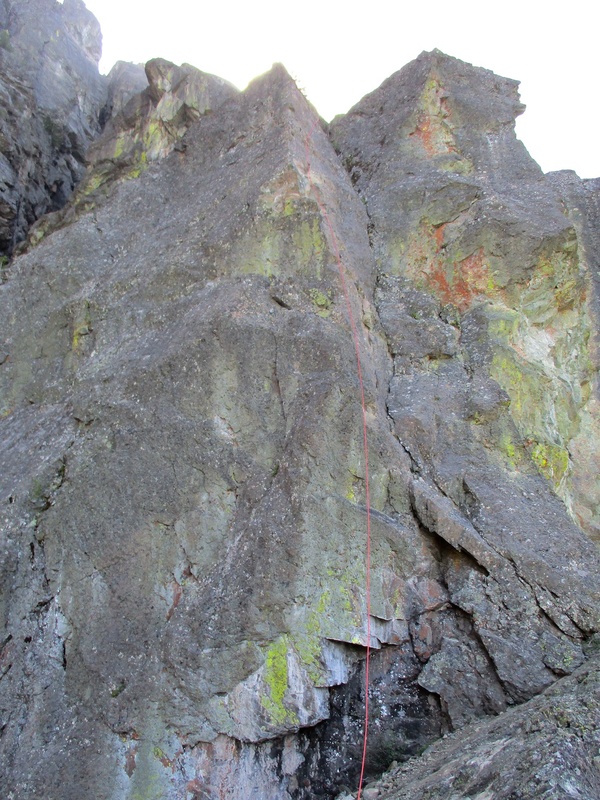 It is also the newest of the above-mentioned routes on Goat Wall, established in 2016 and 2017 by Brian Burdo and Jerry Daniels. The following description of Flyboys from an article on climbing.com. 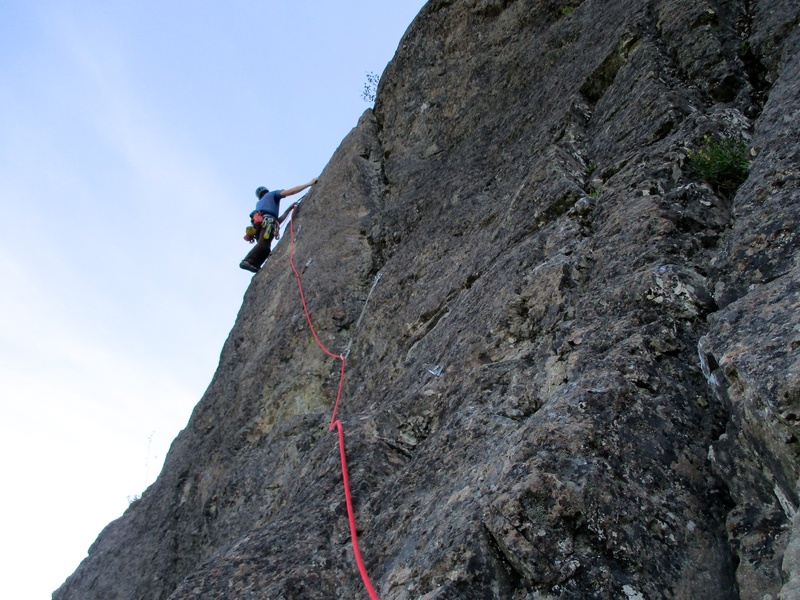 "Flyboys wanders up two pitches of slab before snaking up the main buttress. The route toes the edge of the arête, coming to a heady fourth pitch (5.9) as you move out on an exposed traverse to the edge. From there, you tackle features like the Flying Staircase and the Bomb-Bay Squeeze Chimney, and must engage in occasional third class route-finding. 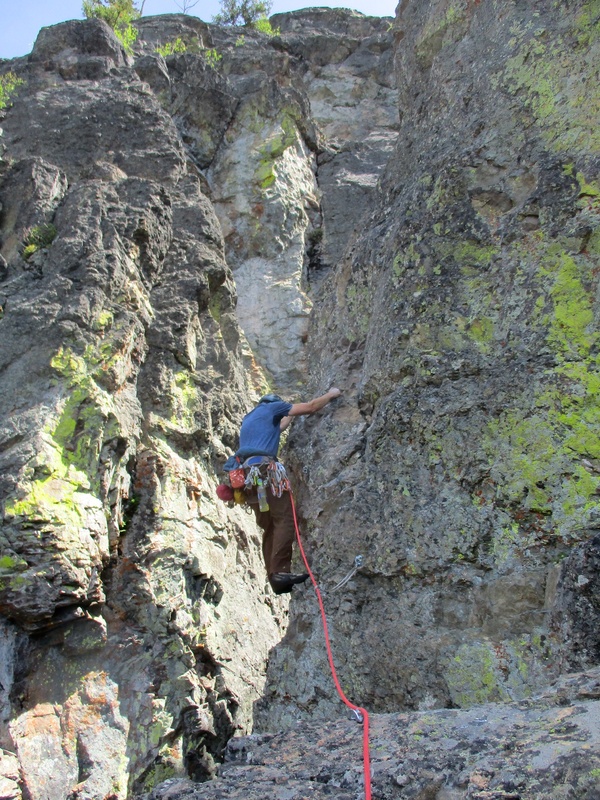 The crux comes on the final pitch, requiring three consecutive 5.9+ boulder moves to summit. 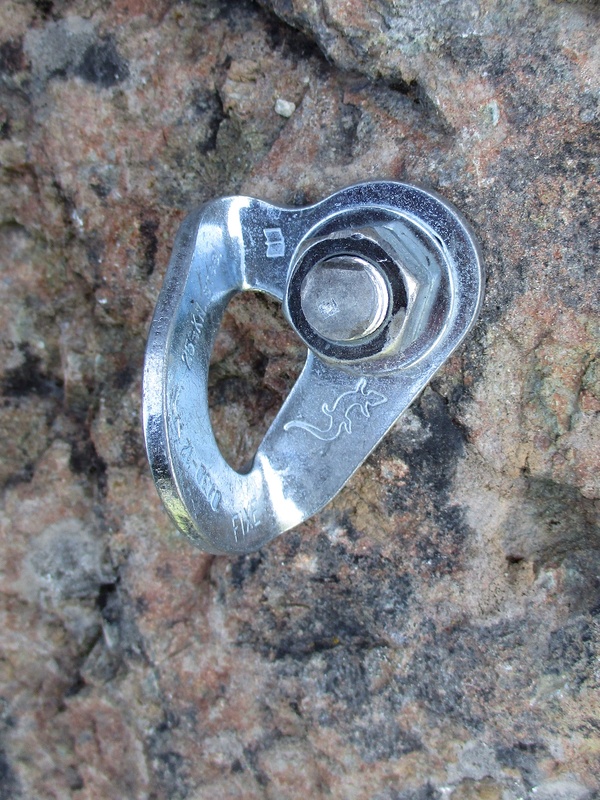 “Every 5.9 pitch would be one of the best at nearly any crag,” Burdo says. 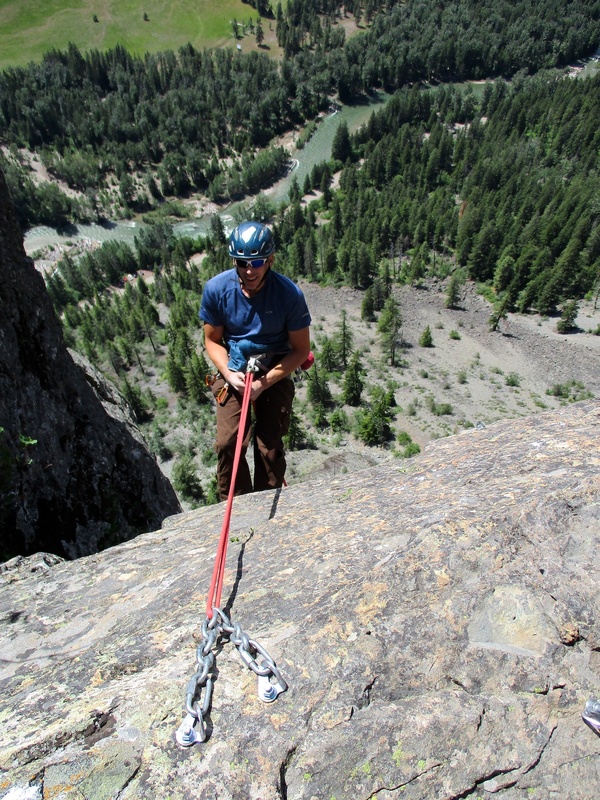 “It’s all great rock, thousands of feet above the valley floor.” Burdo, who has been developing routes in Mazama for 30 years, had eyed the line since putting up Prime Rib of Goat, but it wasn’t until partner Jerry Daniels took an interest that the duo had the manpower." 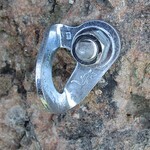 I don't do much sport climbing, but the idea of climbing 18 pitches with nothing more than 16 quickdraws sounds kinda fun. 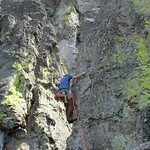 There were 7 parties on the route the day John an I climbed Flyboys. Due to our mid-morning start, we were the 6th party to start up. But John and I were linking pitches and climbing quickly, and ended up catching up and arriving to a bottleneck at the base of Pitch 7. Fortunately, everyone on the route that day was super friendly and the sunny weather had put everyone at ease, so we got the thumbs up to pass. 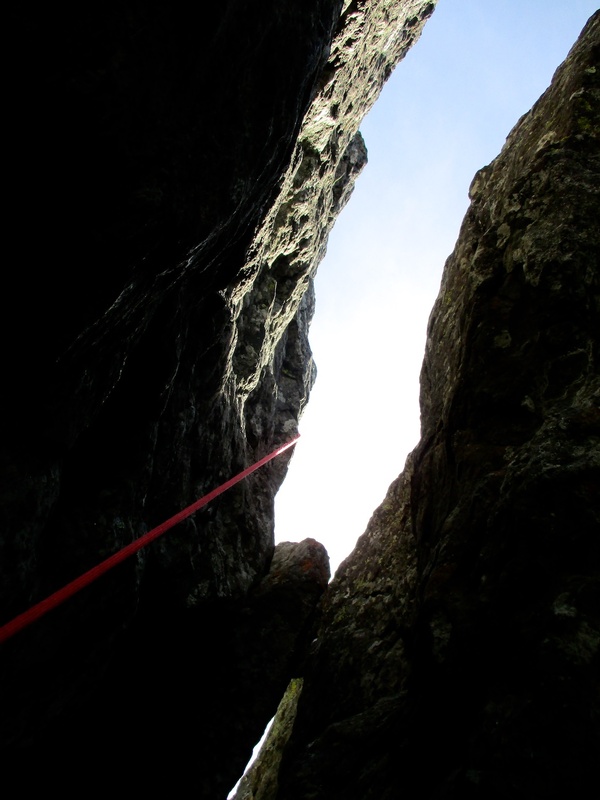 We ended up passing 4 parties in one epic 7-pitch-simulclimb. All told, John and I climbed the 18 pitch route in 6 pitches (linked 1-3, climbed 4 on its own, linked 5-6, linked 7-15 with lots of simulclimbing, linked 16-17, and climbed 18 on its own). Even with the ~20 minutes spent waiting at the base of Pitch 7, we were at the top of the route almost exactly 3 hours after we started. 1.5 hours and 17 (?) single-rope rappels later and we were back at the base, looking ahead at a relaxing afternoon. John enjoyed a burger and beer at the Mazama store with his buddies from the east side while I took the opportunity to write a couple of final exam problems for the upcoming end of the quarter. Flyboys was a fun way to spend half of the day. It was my first time climbing on Goat Wall, and overall I was not overly impressed with the quality of the breccia and tuff that makes up the wall. The route itself was not too memorable either; there were a few sections of good 5.9 climbing, but these were short and few. 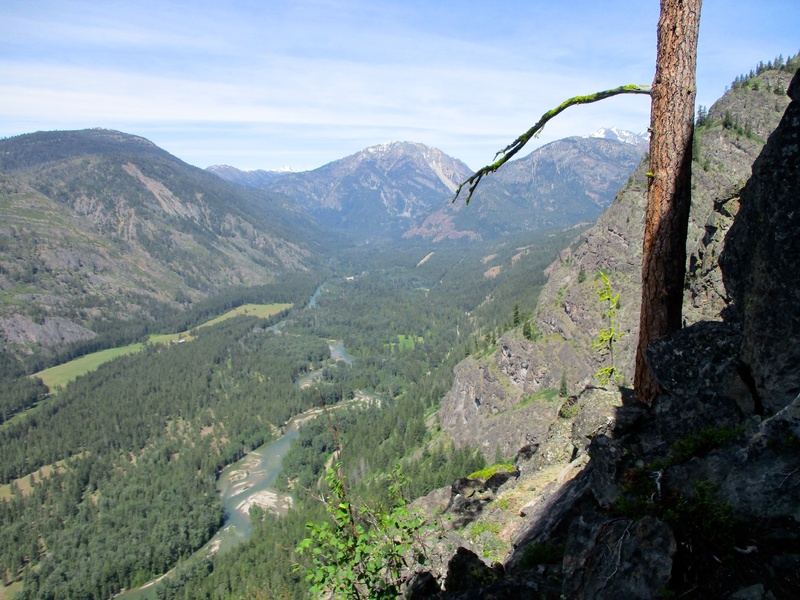 Nevertheless, I'd say that Flyboys is a worthy climb if only for the continual movement and ease of following a trail of bolts 1500 vertical feet, with the views of the pretty Methow Valley stretching below and the tops of a few North Cascades summits peeking over the ridge the higher we got on the route. So I'd recommend it for an enjoyable day on the rock. 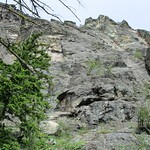 Below this are some photos of the climb. 2. 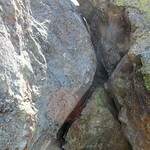 Base of Pitch 1. 3. Follow the 275 shiny bolts to the top, like ants following a trail of crumbs. 4. 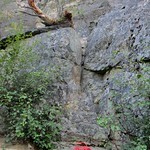 Fun exposed 5.9 face climbing on Pitch 4. Wish there was more of this. 5. A fun 5.8 corner on Pitch 6. 6. Traffic jam at the base of Pitch 7! Everyone on the route was so friendly, and offered to let us pass them. 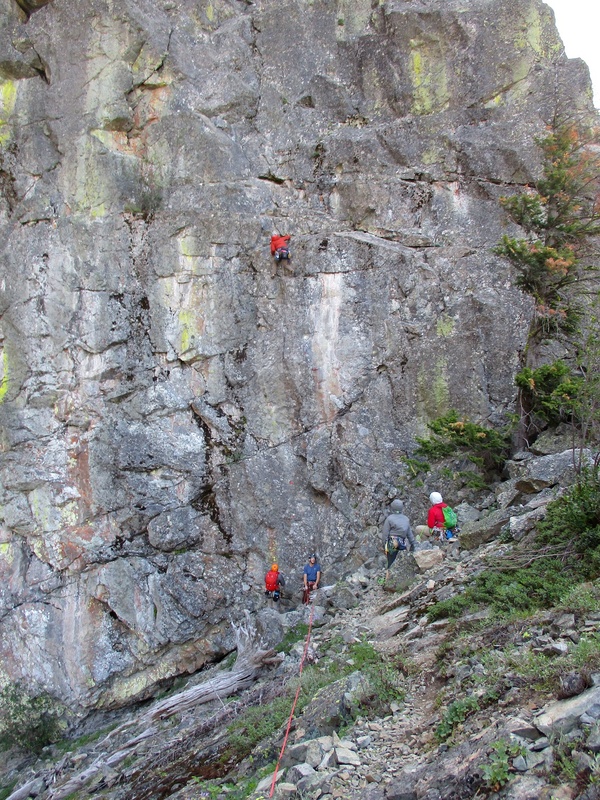 We ended up linking Pitches 7-15 in one long simulclimb to pass a total of 4 parties in one pitch. 7-8. 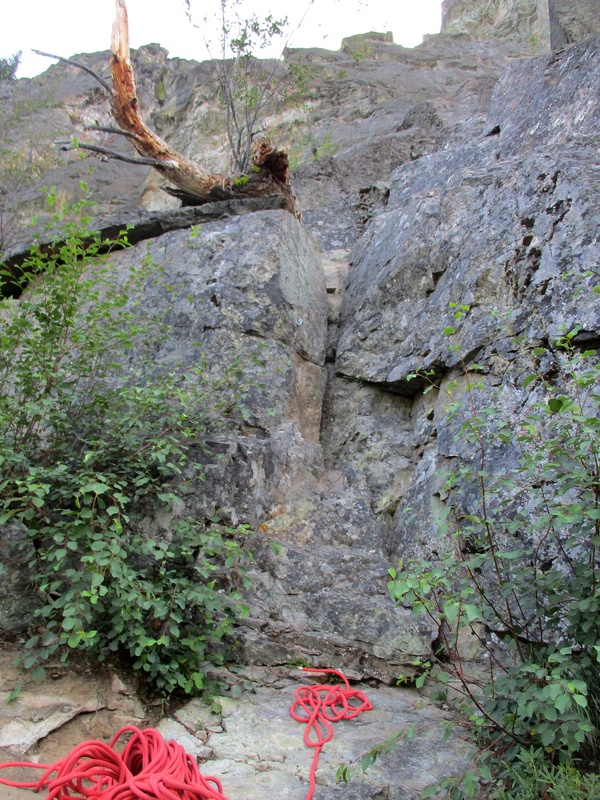 A chimney section near the top of Pitch 14. This move felt harder (5.9+ or so) than any other move on the route. 9. 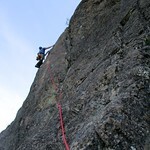 Pitch 16 climbs steep 5.8 jugs. 10. 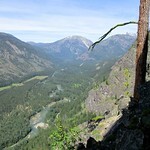 View northward up the Methow Valley. 11. 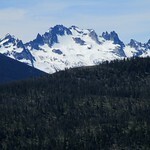 Silver Star and Wine Spires to the south. 13-14. 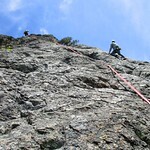 There are two decent options: walk off (which requires a car shuttle) or rappel (17 (?) 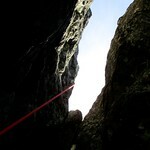 single rope rappels back to the base). 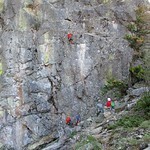 We chose to rappel. 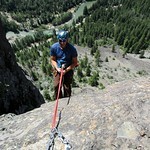 There are rap stations just off to the side of the belay stations on Flyboys. Rap stations are equipped with nice chains. 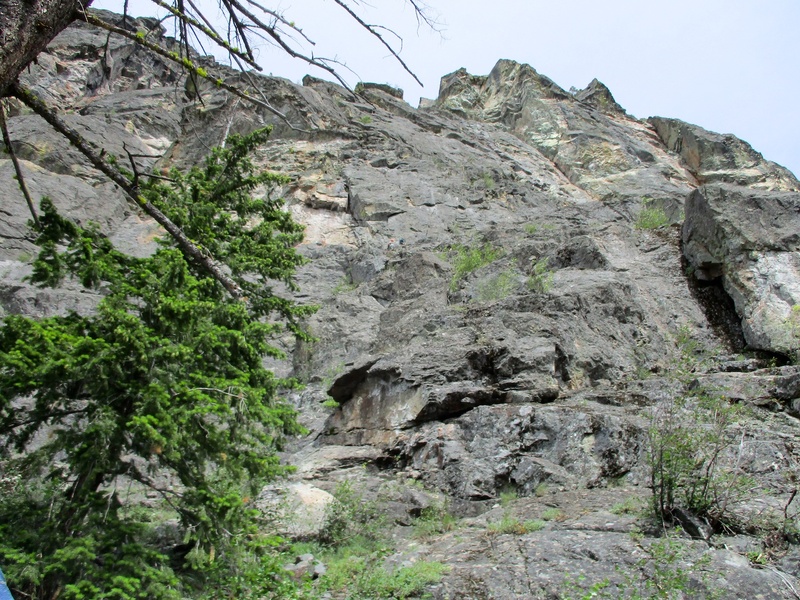 Since the rap line is just beside the route the whole way down, watch out for kicking off loose rock (there's a fair bit of it on the ledges), especially if there are other parties climbing the route.